Among all parrot species, the African Grey is noted for its ability to speak following simple coaching. This book, an updated addition to Barron’s Complete Pet Owner’s Manuals series, advises on all aspects of African Grey health care, caging, training, nutrition, behavior, and more. Written primarily for prospective and inexperienced pet owners, as well as for older children who are learning about responsible pet care, Barron’s Complete Pet Owner’s Manuals present basic pet care information. The many titles in this series cover all popular dog and cat breeds, bird varieties, hamsters and other small caged animals, aquarium fish varieties, terrarium pets, and even reptiles, amphibians, and exotics. Each title features approximately 70 color photos and advises on acquiring an animal, housing, feeding, health care–and, where applicable, grooming and training. 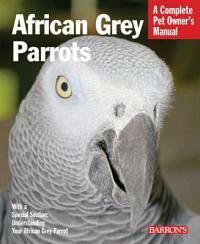 Be the first to review “African Grey Parrots” Click here to cancel reply.